These herbaceous sea salts are paired with positive affirmations for an even more soothing spa experience. Soothe your body and lift your spirits every time you sink into a nice, warm bath with this set of luxurious sea salts paired with positive affirmations. 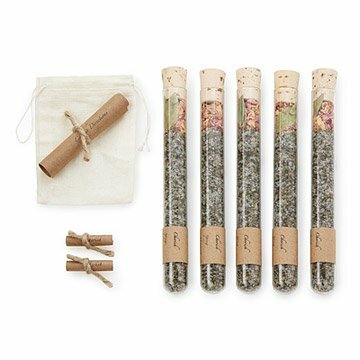 This set includes five glass test tubes filled with mineral-rich Dead Sea salt, a myriad of organic herbs and flowers, such as dill, parsley, tarragon, cilantro, myrtle, and marjoram, plus sweet pink roses and therapeutic grade essential oils. Each bath salt is accompanied by a hand-selected affirmation scroll which will set the mood for your relaxing soak in the tub as well as prepare your mind for a transporting experience. Handmade by Shari Sweeney in North Carolina. Dead Sea salt; organic herbs and flowers including: dill, parsley, tarragon, cilantro, myrtle, pink roses and marjoram; therapeutic grade essential oils of dill, parsley, tarragon, marjoram, cilantro, myrtle and palmarosa. Shari Sweeney earned her degree in Biological Sciences from North Carolina State and she had the pleasure of doing scientific research for over ten years in top-notch laboratories. It was during her time doing research that she began to truly understand the types of chemicals that are in most of our body care products rethinking what we are putting on our skin and how it affects us at a cellular level. Also during this time, holistic living became a core focus in her life. To her, the connection of the mind, body, and spirit are key factors in living a well-balanced life. Her technical experience gained from years of scientific research along with implementation of holistic modalities came together to create her holistic and luxurious bath and body care products. Read a Q&A with Shari on our blog. My wife loves the aroma of the bath salts. A great gift!